Acid Reflux is when your body becomes too acidic, it will attempt to compensate by retaining alkaline salts in the bloodstream to offset the increase of tissue acidity. Since your body can only tolerate a small imbalance in blood pH, it will rob alkaline components from other places including your body’s precious alkaline reserves in an effort to restore a proper pH balance. This can result in acid reflux heartburn, digestive distress, stomach upset, fatigue, and a multitude of varying symptoms. You’ve just eaten a big meal and leaned back in your favorite chair. Then it happens. Your chest starts to hurt so much it feels like it’s on fire. Every day, more than 15 million Americans experience heartburn, which produces a burning sensation behind the breastbone. You may also experience a sour taste and the sensation of food re-entering your mouth (regurgitation). 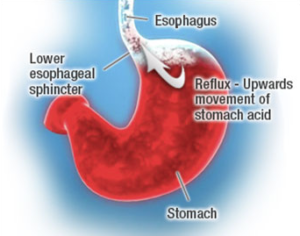 It results from gastroesophageal reflux, a condition in which stomach acid or, occasionally, bile salts back up into your food pipe (esophagus). When there’s also evidence of esophageal irritation or inflammation, you have gastroesophageal reflux disease (GERD). Normally, the lower esophageal sphincter blocks most acid from coming up into the esophagus. This circular band of muscle at the lower end of the esophagus doesn’t open except when you swallow. If the sphincter relaxes abnormally or weakens, stomach acid can back up and cause heartburn. Most people can manage the discomfort of heartburn with lifestyle modifications, such as improved diet, over-the-counter antacids and weight loss. But if heartburn is severe, these remedies may offer only temporary or partial relief. You may need newer, more potent medications to reduce symptoms. Control your weight. Being overweight is one of the strongest risk factors for heartburn. Excess pounds put pressure on your abdomen, pushing up your stomach and causing acid to back up into your esophagus. Eat smaller, more frequent meals. Three smaller meals a day, with small snacks in between, will help you stop overeating. Continual overeating leads to excess weight, which aggravates heartburn. Loosen your belt. Clothes that fit tightly around your waist put pressure on your abdomen and the lower esophageal sphincter. Eliminate heartburn triggers. Everyone has specific triggers. Common triggers such as fatty or fried foods, alcohol, chocolate, peppermint, garlic, onion, caffeine and nicotine may make heartburn worse. Avoid stooping or bending. Tying your shoes is OK. Bending over for longer periods to weed your garden isn’t, especially soon after eating. Don’t lie down after a meal. Wait at least three to four hours after eating before going to bed, and don’t lie down right after eating. Raise the head of your bed. An elevation of about 6 inches puts gravity to work for you. You can do this by placing wooden or cement blocks under the feet at the head of your bed. If it’s not possible to elevate your bed, you can insert a wedge between your mattress and box spring to elevate your body from the waist up. Wedges are available at drugstores and medical supply stores. Raising your head only by using pillows is not a good alternative. Don’t smoke. Smoking may increase stomach acid. The swallowing of air during smoking may also aggravate belching and acid reflux. In addition, smoking and alcohol increase your risk of esophageal cancer. Several home remedies exist for treating acid reflux / heartburn, but they provide only temporary relief. They include drinking baking soda (sodium bicarbonate) added to water or drinking other fluids such as soda pop or milk. Although these liquids create temporary relief by neutralizing, washing away or buffering acids, eventually they aggravate the situation by adding gas and fluid to your stomach, increasing pressure and causing more acid reflux. Further, adding more sodium to your diet may increase your blood pressure and add stress to your heart, and excessive bicarbonate ingestion can alter the acid-base balance in your body. Before you spend money on medications or alternative medicines, it would be worthwhile to do some homework. In particular check out the side effects of the medications you are taking or intending to take, and in particular look for dangerous interactions with drugs you are already taking for your treatment of Acid Reflux / Heartburn . Below is a link that provides documentation to what we believe and recommend to be a safe and effective alternative to treating Acid Reflux with prescribed medication.